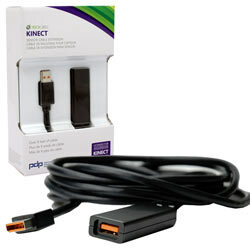 The Cable Extension for the Xbox 360 Kinect Sensor will allow you to extend your connection by 10 feet, allowing you to place your Xbox 360 Kinect Sensor virtually anywhere in your living space. The Cable Extension is great for all but will best appeal to consumers with large living spaces and entertainment centers. This design has been inspected and approved by Microsoft.